President Muhammadu Buhari, yesterday, made a robust defence of the integrity of all 36 ministers in his cabinet challenging anyone with a contrary view to present evidence against such a minister. Speaking in his first media chat, the president said the first gains of the war against corruption would become evident by the end of March, next year, even as he accused erstwhile National Security Adviser, Col. Sambo Dasuki (retd.) of having allegedly committed atrocities against Nigeria through reckless disbursement of billions of government funds. The president made his first dismissal of the agitation for Biafra stating that Igbo were in strategic position in the cabinet including holding the petroleum and labour portfolios besides the stewardship of the Central Bank of Nigeria, CBN. President Buhari also assured of the administration’s readiness to implement the N5,000 monthly transfer to vulnerable Nigerians even as he said the campaign promise did not emanate from him but from his then running mate, Vice-President Yemi Osinbajo. He also frowned at the allocation of N47.7 billion for the purchase of vehicles by the National Assembly even after the lawmakers had collected car loans from the government. 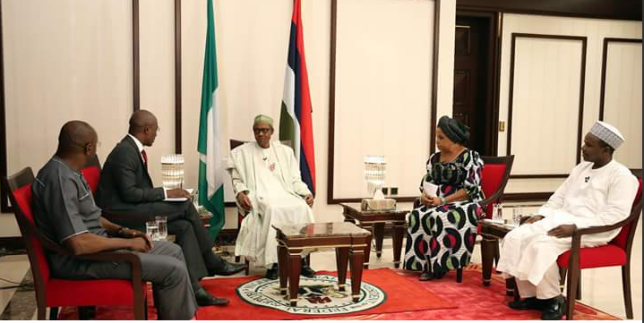 The president, who expressed his readiness to negotiate with any credible leadership of the Boko Haram sect for the release of the kidnapped Chibok girls also disclosed his readiness to consider a ban on the use of hijab should the trend of bombing through young veiled girls continue. Noting the dire economic conditions facing the country, President Buhari was, nevertheless, against the immediate devaluation of the naira even as he revealed that N1.5 trillion had been recovered into the federation account through the implementation of the Treasury Single Account. The president also spoke on the fate of the Islamic cleric, Sheikh Ibraheem El-Zakzaky, saying that he had allowed the Kaduna State government and the military authorities to take the lead in the investigations. He affirmed that the cleric had over time overstepped his bounds to the distress of the communities he lived. “I don’t think I tolerate corruption, I don’t think I picked anybody that I know will embarrass my government. But if you have any evidence about any of my ministers, I accept responsibility for the 36 ministers that I have. “I expect the Kaduna State Government to set up a judicial inquiry because it happened in Kaduna, in one of the cities and it has been there for the last twenty years from what I have been reading from papers. They will occupy a federal highway, sometimes from Kano to Kaduna. This is what I heard. “We have a system of investigation, the military that was involved too have a tradition of investigation and I am the head of the federal government, I have to wait for the official report before I can come out as head of the federal government and make a statement. So I am allowing the Army and the Kaduna State government to submit their report of inquiry. Meanwhile it does not mean that the police, the SSS and other directorate involved are not doing their own part of constitutional role. “Unfortunately it is very serious. How can any group proclaim statehood in a state? I don’t want to speak about it in details now, I better leave it still after the report of the inquiry but there are a number of clips I saw, where some excited teenagers were visually hitting the chest of a general, mounting road blocks and threatening them with missiles. On the contentious issue of subsidy, the president said that by the end of the next quarter that there would be no more talk about subsidy in the price of petroleum.